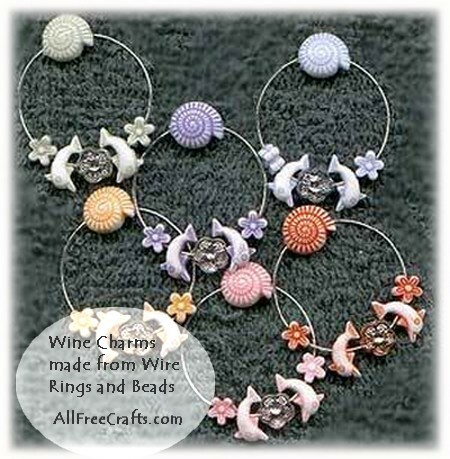 Follow our easy craft instructions to make your own homemade set of distinctive wine glass charms. These are very easy to make and quite charming! They are a wonderful way to keep track of who’s who when it comes to identifying each guest’s wine glass. I made several sets of these using different colour beads and different themes. All of the beads used in these charms were purchased at a local dollar store making these very inexpensive. I used ready made wire rings, but you can shape wire to the desired size if you like. These rings have a loop at one end (preventing the beads from falling off) and a cut end. Decide the order of your beads and begin feeding them onto your wire ring. To secure your beads add a dot of glue to the cut end of wire and slip a final bead over the glue without pushing the bead down the wire. This eliminates the pointed end of wire, prevents your beads from slipping off the wire and adds an additional decorative touch to your charms. You’ll find that the charms can pull apart so you can add them to the stems of your wine glasses while concealing the loop end of the wires behind the final decorative beads.